* Epoxy coatings will characteristically chalk and fade upon exposure to sunlight. Light colors are prone to ambering to some extent. * For immersion service, the product should be applied at a minimum of 10 mils dft total in 2-3 coats. NACE WJ-2(L). The wet surface can be dried by blowing with dry compressed air giving special attention to horizontal surfaces and recesses. as necessary based on the hardness of the substrate. Aluminum may be treated with a surface treatment compliant with Mil-DTL-5541 or equivalent (non-immersion applications only). products or chalky residue. Abrade surface, or clean with Prep 88. 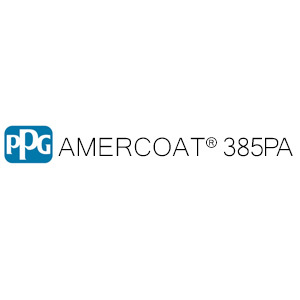 Amercoat 385 is compatible over most types of properly applied and tightly adhering coatings, however, a test patch is recommended to confirm compatibility. Surface temperature – Must be at least 5°F above dew point temperature. Area should be sheltered from airborne particulates and pollutants. Avoid combustion gases or other sources of carbon dioxide that may promote amine blush. Ensure good ventilation during application and curing. Provide shelter to prevent wind from affecting spray patterns. with local or national rules/circumstances. Under these circumstances an alternative product data sheet is used. effect at the time of manufacture and (iii) that the product shall be delivered free of the rightful claim of any third person for infringement of any U.S. patent covering the product.